ysabetwordsmith | Poem: "The Cure for Anything"
Poem: "The Cure for Anything"
This poem is from the January 6, 2015 Poetry Fishbowl. It was inspired by prompts from curiosity and LJ user Wyld_Dandelyon. It has been sponsored by curiosity. This poem belongs to the Aquariana thread of the Polychrome Heroics series. about water's response to energy. who taught hydrology in Japan. superpowers to manifest the pattern. her erratic results with Water Form. they both suspected emotional aspects there too. of the connection between water and feelings. the negativity pouring off him. as she plucked the bottle out of his hand. you'll make yourself sick or something." "Oh, not with that woo-woo magic ice nonsense,"
Seth grumbled. "That was disproven." "Then you haven't seen the later studies,"
Aquariana said. "I can just show you." which she set in the freezer. images of water exposed to different emotions. Seth admitted that she might have a point. managing to make it worse. "Here, see what you can do with this." for ten minutes, until it turned to sludge. "See, that always happens," said Dredge. "My power's evil, no matter what I try to do with it." "It's not evil, just ... murky," Aquariana said. and that influences the water." "Like I said, I'm evil," said Dredge. "No more than I am," he said. or survived bad things happening. you'll stop making sludge like that." "Are you a supervillain too?" Dredge asked. "No he is not," Aquariana said. so now Seth feels guilty about that. who tries to destroy the Earth on purpose." and how to manifest it in ice. he couldn't get the hang of that. or guiding it safely," Aquariana said. "I don't know how," Dredge whispered. "You can stay here and practice,"
Seth could use a hand around the office. we can go beachcombing together too. to shift your emotions in a more positive direction." and Seth was watching both of them as well. "The cure for anything is salt water,"
said Aquariana, "sweat, tears, or the sea." Emoto (Dr. Masaru Saito) -- He has golden skin, brown eyes, and straight dark hair. He is married and has a daughter named Hiroyuki, who was assigned male at birth and named Hiro, but later declared herself a girl and changed her name. Hiro and Hiroyuki are traditionally masculine names, but Oyuki is a snow-woman and a feminine name. Masaru has been supportive of her identity. During the 1990s Dr. Saito studied water extensively and discovered a connection between water and emotion, that people could influence the pattern of ice crystals and that water exposed to positive emotions produced more symmetrical crystals than water exposed to negative ones. For years he was frustrated that others could not consistently reproduce his results. Then he learned that he had superpowers -- and that while ordinary people could imprint energy on water, it requires Water Control to manifest the pattern. Erratic results can come from people with subclinical powers, supernaries with intense mental training, and other factors. Origin: Born in Yokohama, he may be one of the many Japanese soups whose powers have nuclear influence. Motivation: To learn about water and feelings. Dredge (Shadhu Thakurfan) -- He has cinnamon skin, brown eyes, and shaggy dark brown hair. He is a carrier for β-thalassemia, and people are starting to suspect a connection between thalassemia and Water Powers, particularly saltwater versions. Dredge is a native of the Maldives, with some Indian and Arabic heritage as well. He smokes cigarette or cigar butts, whatever he can find on the ground. No matter how carefully he tries to tidy up when he has the opportunity to do so, he always looks messy. Dredge is a free spirit who prefers to avoid the authorities, even if official involvement has perks. Origin: His mother worked in a factory where toxic chemicals were not handled very safely, and he often played nearby. Dredge believes that contributed to his superpowers. Uniform: He wears castoffs and secondhand clothes, whatever he can find. Poor (-2) But I Just Combed It! Water is associated with emotions. 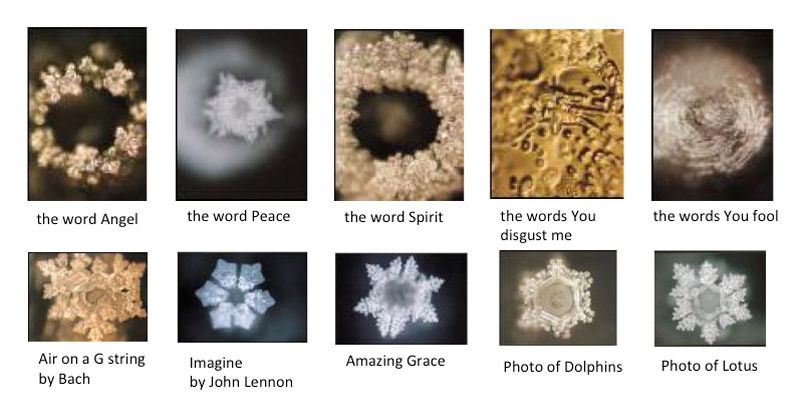 In our world Dr. Masaru Emoto (July 22, 1943 – October 17, 2014) was known for his work and photographs featuring water purity and emotions. Replication has been erratic, but here is one example. Tears, like ice, may reveal emotions. Here's an artist manipulating water with technology and her mind. In Terramagne a water controller could do that with superpowers. Street people include children and teens as well as adults. Self-blame may be characterological or behavioral. When someone feels like an evil person, that is characterological. People debate nature vs. nurture and what makes someone evil. Certain character traits are considered evil. There are tips on how to be a good person and how to feel good about yourself. Buddhism has a rich tradition in the Maldives. In Terramagne it is more popular than here. Buddhism teaches mindfulness which has many benefits, including improved control of emotions and abilities. Learn how to practice Buddhist meditation. "The cure for anything is salt water," said Aquariana, "sweat, tears, or the sea." I'm so happy to hear that. It's fun when fans follow me around the net. :D I hope that you're enjoying the trip.